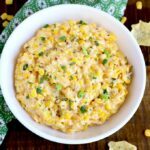 Corn Dip is a mouthwatering creamy and cheesy dip made effortlessly in your slow cooker. This easy cream cheese dip is packed with corn, green chiles, Pepper Jack, mozzarella and Cheddar. Combine the corn, green chiles, cream cheese, mayonnaise, Pepper Jack cheese, mozzarella, Cheddar, garlic powder, salt and sliced green onions in the slow cooker. Cover and cook on LOW for 2 hours, stirring a couple of times through the cooking process. Garnish with sliced green onions and chopped cilantro (optional) and serve warm with tortilla chips or crackers. If using frozen corn, you can add the frozen corn directly into the slow cooker. Thawing is not needed.